Chen, Q., Liu, G., Chen, G., Mi, T., and Tai, J. (2017). "Green synthesis of silver nanoparticles with glucose for conductivity enhancement of conductive ink," BioRes. 12(1), 608-621. This work reported a green method of synthesizing silver nanoparticles (AgNPs) with glucose acting as reducing agents to improve the conductivity of conductive ink. Silver nitrate, glucose, and polyvinylpyrrolidone (PVP), were used as silver precursor, reducing agent, and capping agent, respectively. The optimal condition of synthesizing AgNPs was obtained by varying the reactant ratio and temperature. The AgNPs were characterized by X-ray diffraction (XRD), UV-visible spectroscopy (UV-Vis), and scanning electron microscope (SEM). The obtained AgNPs with diameters of 80 to 100 nm were almost spherical and they were redispersed well in polyurethane acrylate (PUA). Compared with traditional hydrazine hydrate, the prepared AgNPs were better with respect to uniform size, dispersion, stability, and the absence residual solvent. After UV sintering, the conductivity (2.3×105 S/m) and mechanical properties of prepared conductive ink were good. Therefore, using glucose as a reducing agent to prepare AgNPs conductive ink is feasible and noteworthy because it is an extremely common material. There is great demand for conductive inks in electrical fields such as mobile phone or large industrial areas (Krebs 2009). 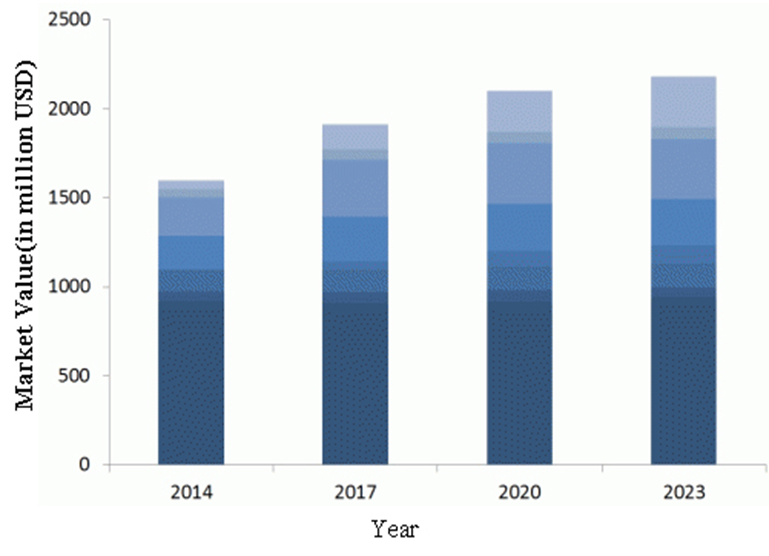 Figure 1 is a prediction of the conductive ink market made by IDTechEx (RWN 2013), in which it is shown that this market will continue to grow at a compound annual growth rate of 2.7% in the next 10 years. The conductive materials and curing technology are very important to conductive ink (Letzel et al. 2016). In the past, the use of conductive filler (metallic metal micron-sized particles (Li et al. 2014) was very common. However, it has been replaced by metal nanoparticles, which has excellent electrical and thermal properties. Silver nanoparticles (AgNPs) have been studied widely due to their high conductivity, good stability, and low cost (Kim and Moon 2005; Xu and Zhu 2012; Yu et al. 2015). There are several methods of preparation, such as sunlight assisted synthesis (Meenakshi et al. 2016), competent green chemistry synthesis (Dong et al. 2014; Morales-Luckie et al. 2016; Shen et al. 2016; Kim et al. 2006), electrochemical synthesis (Thuc et al. 2016), and biological synthesis (Rathod et al. 2016). Among these methods, the chemical method is relatively simple. There are many advantages of glucose when it is used as a reducing agent, since it is an inexpensive ingredient widely used in many biomaterials. In addition, no residual solvent is typically present in AgNPs colloidal solutions, compared to the traditional hydrazine hydrate (Yang 2015; Dong et al. 2016). Curing technology has also attracted intensive attention. Commonly there are two methods: high temperature sintering technology and UV curing technology. High temperature leads to the small metal particles dissolving in the large particles. As a result, metal particles become connected and a sintering pattern results in conductivity. According to this principle, metal particles that are more poorly dispersed may tend to give higher conductivity of conductive ink. On the other hand, UV curing technology is carried out with the crosslinking reaction under UV light; thus the better the monodispersity metal particles is, the higher will be the conductivity. Traditionally, high temperature sintering technology has been used commonly. But there are many disadvantages such as high energy consumption, volatile organic compounds (VOCs), and environmental damage. UV curing technology can be a good solution to the problems mentioned above (Wei et al. 2004; Zhai et al. 2013). Damage to base materials can be avoided when conductive ink is used in plastic films (Hicks et al. 1980), electronic products, and paper, and the emissions of harmful substances are limited because it uses an active diluent instead of VOCs for curing. In this paper, a green synthesis method for AgNPs is proposed. Glucose was used as a reducing agent to prepare AgNPs at low temperature. Glucose will not gelatinize or become adhesive at low temperatures; thus it can play an effective role as a reducing agent. Low temperature processing is reasonable strategy to minimize energy usage, and the AgNPs obtained are difficult to connect together. The protective role of PVP can be preserved under low temperature conditions. Glucose is environmental friendly and easy to obtain. Compared with the traditional hydrazine hydrate, the particle size of nanosilver prepared by glucose is more uniform and has good dispersion, which is important to the conductivity of conductive ink. Based on these previous analyses, the optimal method for the preparation of nanosilver conductive ink is summarized. Glucose (C6H12O6) and polyvinylpyrrolidone (PVP, K50) were purchased from Boao Biotechnology Co., Ltd. (Shanghai, China). Silver nitrate was supplied by Sinopharm Chemical Reagent Co., Ltd. (Shanghai, China). Sodium hydroxide (NaOH) was purchased from Chemical Reagent Co., Ltd. (Nanjing, China). Anhydrous alcohol was supplied by Chemical Reagent Co., Ltd. (Nanjing, China). Hyperbranched polyurethane acrylate (PUA) was purchased from Zhiyuan Chemical Reagent Co., Ltd, (Tianjin, China). Isophorone diisocyanate (IPDI), hydroxyethyl methylacrylate (HEPA), and pentaerythritol were purchased from Zhiyuan Chemical Reagent Co., Ltd. (Tianjin, China). The above reagents were of analytical purity and were used without further purification. Double distilled water was used in this experiment. 250g double coated white cardboard used to be basic material, which purchased from Hongta Renheng Paper Co., Ltd. (Zhuhai, China). A green method of synthesizing AgNPs (Shen et al. 2015) used glucose as the reducing agent, PVP (Pang et al. 2014) as a protective agent (dispersant) (Niu and Jiang 2007), silver nitrate as the source of silver, and NaOH to provide an alkaline environment. The oxygen reduction reaction is shown below. In this paper, the molar ratio of silver nitrate, glucose, and protective reagent was 1:2:1.5. The experimental steps were as follows. Solid glucose (0.7206 g) and PVP (0.3300 g) were added into a 250 mL round bottom flask with distilled water (50 mL). The reaction was stirred (1500 RPM) at 80 °C for 60 min to obtain solution A. Next, AgNO3 (0.3398 g) and NaOH (0.0810 g) were placed in a 100 mL beaker. Distilled water (20 mL) was added to obtain solution B. Solution B was added to the round bottom flask containing solution A. Under the previous condition for 120 min, the color of the solution slowly changed from yellow to yellowish brown to grey, creating solution C. After cooling to room temperature, solution C was added to a 5 mL centrifugal tube and processed at 10000 RPM for 10 min in a centrifuge. The resulting supernatant was decanted, and anhydrous ethanol was added. After dispersion by ultrasonic cleaner, the nanometer silver solution was cleaned three times at 10000 RPM for 10 min. After three washes, a small amount of nanometer silver was used for SEM analysis, and most of the product was dried at 70 °C in a vacuum drying oven. After drying and milling, the nanometer silver particles were generated. 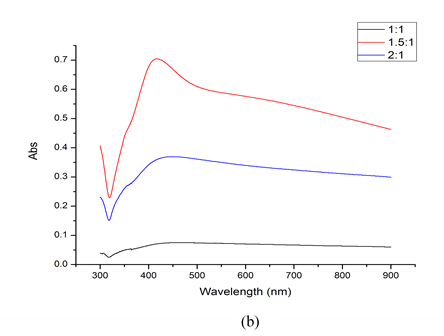 UV-Vis spectra of AgNPs were collected on a spectrophotometer (UV-2201, SHIMADZU, Japan), within a spectral scanning range of 600 to 300 nm under the fast-speed mode, and the scan interval was 0.5 nm. The particle size distributions of AgNPs were obtained using a Malvern laser particle size analyzer (3000 HAS, Malvern, England), and ultrasonic treatment was required before measuring. The shape and distribution of AgNPs were observed by a laser scanning microcopy (LSM710, ZEISS, Germany), which worked with an accelerating voltage of 3KV; a few drops of the suspended AgNPs/anhydrous alcohol were placed on a copper grid coated with ultrathin carbon film. The crystal structure of AgNPs with dialysis was investigated by a D8 ADVANCE X-ray diffractometer (XRD; Bruker, Germany). In this work, PUA was used as the bonding agent of a new type of water-based UV conductive ink. It contains acrylic acid functional groups that can give ink excellent optical performance and amino formic ester bonds in the molecule. At the same time, amino formic ester bonds equipped the ink with flexibility, adhesion, and high peel strength. In this experiment, IPDI was used to provide the isocyanate group (-NCO). Polyethylene glycol (PEG6000), IPDI, and 1,4-butylene glycol (the molar ratio respectively is 2:1:1) were placed in flasks and mixed evenly to obtain polyurethane prepolymer which equipped with -NCO. PETA and HEMA (the molar ratio is 1:1) were added in the flask to obtain the hyperbranched polyurethane acrylate solution. The synthesis is shown in Fig. 2 (Yang et al. 2011). It was necessary to add some photo-initiator in the hyperbranched polyurethane acrylate solution. AgNPs powder (0.5 g) was blended with the connecting material in accordance with the proportion of silver accounting for the conductive ink of 30%, 40%, 50%, 60%, 70%, and 80%. Next, ethyl acetate was added into the nanosilver powder. The mixture was dispersed by ultrasonic cleaner. Finally, a new type of UV conductive ink was generated. The conductive ink, with 66.7 wt% nanosilver content, was printed on white cardboard by means of screen printing technology. The relationship between the number of surface tearing and ink layer resistivity is obtained when pulling on the surface of the conductive ink with 3M adhesive tape. Conductive ink is mainly used in flexible printed circuit, thus there must be a good resistance to bending strength and able to maintain stable under the condition of repeated bending in the conductive ink. 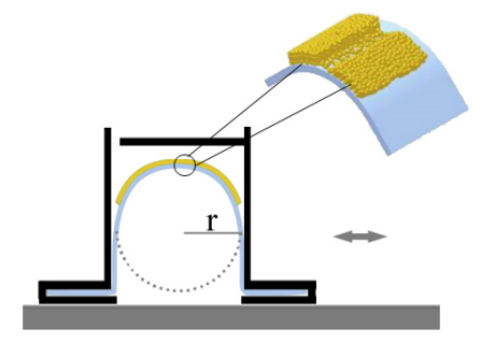 In order to test the change of the conductivity of the ink layer under multiple bending, a simple test device was assembled, as shown in Fig. 3. The left side of the specimen was fixed by a clamp. The right side of the specimen was moved back and forth in the frame. R is the radius of curvature. The bending radius represented the bending degree of controlling of specimen. The bending radius was 5 mm. Figure 4 illustrates the XRD pattern of AgNPs. The five peaks at 38.27°,44.29°, 64.48°, 77.51°, and 81.56° were assigned to diffraction from the (111), (200), (220), (311) and (222) planes of face centered cubic (fcc) silver, which is in good agreement with reference to the unit cell of the fcc structure (JCPDS File No.04-0783). The peak intensity of the (111) planes was very high due to the preferential adsorption of Ag atom on that plane during the growth process. Moreover, there were no impurities evident, which indicated that the nanosilver generated by this method had a cubic crystal structure (Xu and Zhang 2002; Li et al. 2007). 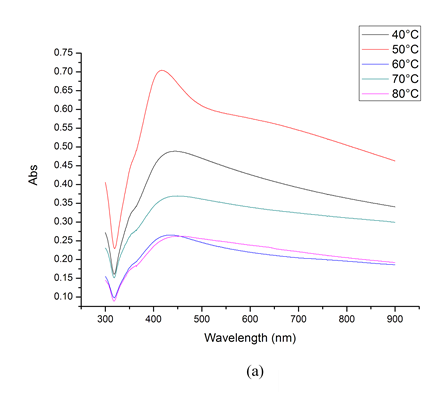 Figure 5b shows the UV-vis spectra of AgNPs with different reaction temperatures from 40 °C to 90 °C. The amount of AgNPs was maximized when the temperature was 50 °C. Therefore, 50 °C was considered as the optimal temperature in this experiment. Fig. 6. SEM analysis of AgNPs prepared with glucose and hydrazine hydrate; the insets show the AgNPs size distribution of nanometer silver; (a) SEM analysis and size distribution for AgNPs with silver reduced by hydrazine hydrate (Chen et al. 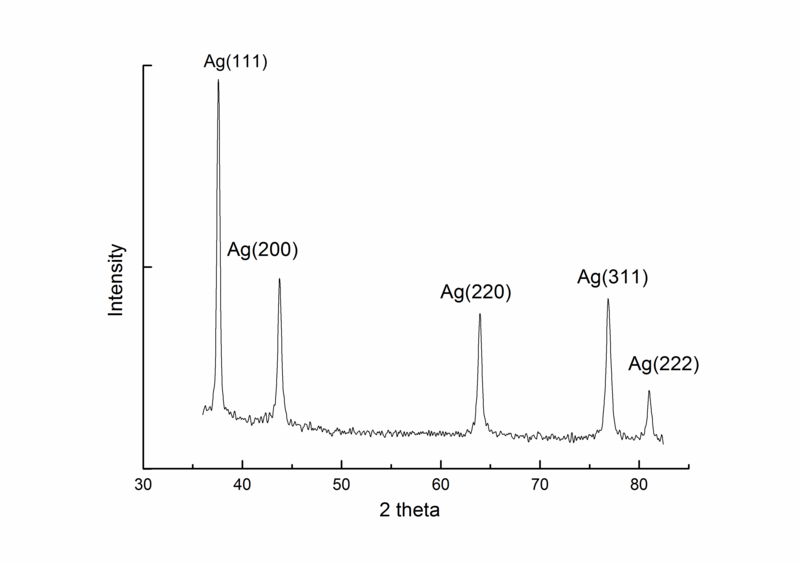 2015); (b) SEM analysis and size distribution for AgNPs with silver reduced by glucose. Smaller AgNPs resulted in larger specific surface area. When surface contact between particles is more comprehensive, the conductive performance of the ink is better. However, nanoparticles must not be too small, because the agglomeration of nanoparticles has a bad effect on the conductivity of ink. Therefore, the use of AgNPs is limited by their size. Another important factor affecting the electrical conductivity of conductive ink is the size distribution of silver nanoparticles. When the particle size distribution is more concentrated, the particle size is more uniform. As a result, the nanoparticles do not easily agglomerate, and the conductive ink has good dispersion and conductivity. The shape and size of AgNPs are shown in Fig. 6. 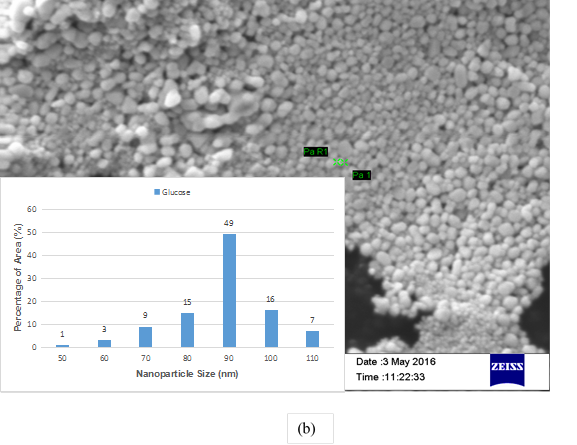 The inset shows the range of nanoparticle size when two different reducing agents were used. According to the SEM images, the particles of Fig.6b were almost spherical and the AgNPS were well dispersed, which was much better than those AgNPs prepared by hydrazine hydrate. 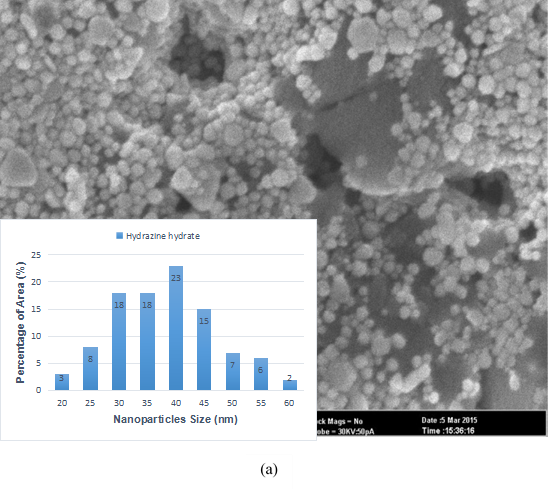 Although the average size of nanoparticles prepared by glucose (88 nm) was larger than those formed by hydrazine hydrate (38 nm), the latter had a wide particle size distribution, and the former was good for uniformity and dispersion, with particle size ranging primarily from 80 to 100 nm. Nano silver particles with high uniformity are favorable for the mutual contact between the particles, which is needed to improve the conductivity of the ink after curing. Table 1 lists the resistance, resistivity, and conductivity of ink with different silver content under a certain depth of ink layer (20 µm) and UV light (365 nm and 10 MW/cm2) for 3 min. The conductivity of the new ink was measured by four-point probe. The performance was best with 70% silver solid content. The maximum conductivity was 2.3 × 105 S/m, which is bigger than the conductivity when using hydrazine hydrate as reducing agents (3.34 × 104 S/m) (Yang 2015). 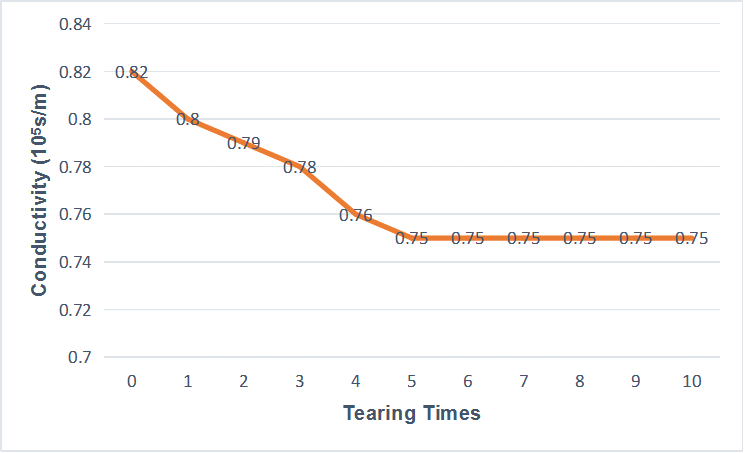 Figure 7 shows the relationship between the number of surface tearing times and ink layer resistivity. This result is divided into two stages. The first stage exhibits a sharp decline. To account for the decline, it was speculated that the tape make have removed some of the AgNPs from the surface of the ink, leading to a decrease in the conductivity. The second stage was stable, which is consistent with the smooth nature of the surface of the resin. Thus, the tape was no longer able to bring out AgNPs. This result indicated that the AgNPs conductive ink prepared by glucose had good tear resistance. 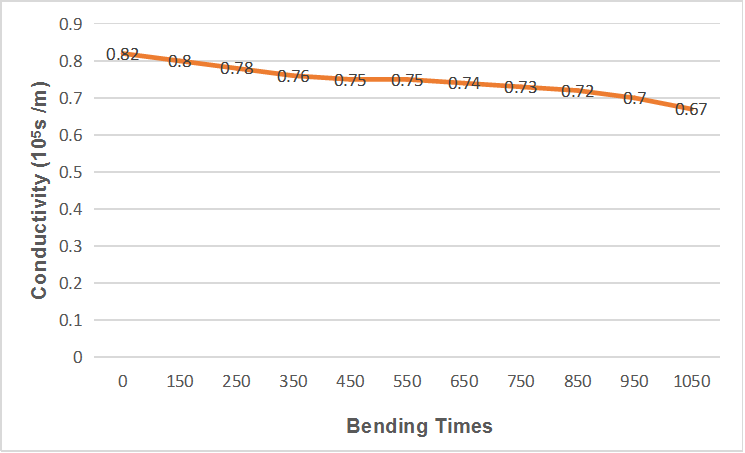 Figure 8 shows the relationship between the number of bending tearing and ink layer resistivity. The conductivity of the conductive ink was slightly decreased at first because AgNPs on the surface of ink layer were stuck and fell off. Afterward, the conductivity was stable. Due to the presence of the resin, the relative position of the nanoparticles is still relatively stable even under the action of external forces. With the ink layer continuously bending, the distance between silver nanoparticles was bigger, so the conductivity showed a slight decrease. This result did not affect the overall electrical conductivity. The AgNPs conductive ink prepared by glucose had good bending resistance. A high-value utilization pathway of glucose to synthesis AgNPs for conductive ink preparation was obtained. The well-dispersed AgNPs were synthesized with glucose as reducing agents, and different reaction conditions were considered. The results reveal that the ratio of glucose to AgNPs had a great influence on the amount of AgNPs, while the effect of temperature was little. The spherical AgNPs were redispersed well in PUA after centrifugation. Moreover, the obtained conductive ink showed good conductivity (2.3 × 105 S/m), which is bigger than the conductivity when using hydrazine hydrate as reducing agents (3.34 × 104 S/m). The obtained conductive ink showed good mechanical property. Therefore, this study provided not only a direction for the valuable utilization of glucose, but also a novel method for synthesis of noble metal nanoparticles, which can conveniently applied in conductive ink. This work was supported by the independent research project of Key Laboratory of Pulp and Paper, South China University of Technology (Nos. 2016C02 and 2016C01), the Science and Technology Project of Guangdong Province (No. 2013B010401007), the Fundamental Research Funds for the Central Universities” (Nos. D2154620 and D2155360), and the Development Fund of Key Laboratory of Pulp and Paper Science & Technology of Ministry of Education of China, Qilu University of Technology (No. KF201502). Chen, Y. Y., Chen, G. X., Cui, Y. Y., Chen, Q. F., Tai, J. L., and Yang, Y. (2015). “Morphology of nano synthesized in different solvent system,” Packaging Engineering 36(21), 34-37+56. Li, J. H., Lu, J. H., Wang, Y. F., Wang, T. Y., and Xiao, J. (2014). “Research development of conductive inks and nanoparticles applied in conductive inks,” Electronic Components and Materials 33(05), 12-16+60. Niu, M., and Jiang, Y. (2007). “Ethanol-thermal reduction synthesis of silver nanoparticles with controllable shapes,” Materials Science and Engineering of Powder Metallurgy 12(3), 183-186. DOI: 10.3969/j.issn.1673-0224.2007.03.012. 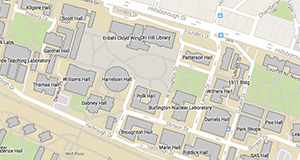 RFID World Network (RWN) (2013). “IDTechEx’s predicts that conductive ink market size will reach 7.88 billion dollars in 2013,” (http://news.rfidworld.com.cn/ 2013_11/43e4178b88b4b5f4.html), Accessed 6 Nov 2013. Yang, Y. (2015). Preparation and performance Study of Paper-based Nano Silver Ink-jet Conducive Ink, Master’s Thesis, South China University of Technology, Guangzhou, China. Article submitted: September 18, 2016; Peer review completed: November 4, 2016; Revised version received and accepted: November 20, 2016; Published: November 29, 2016.